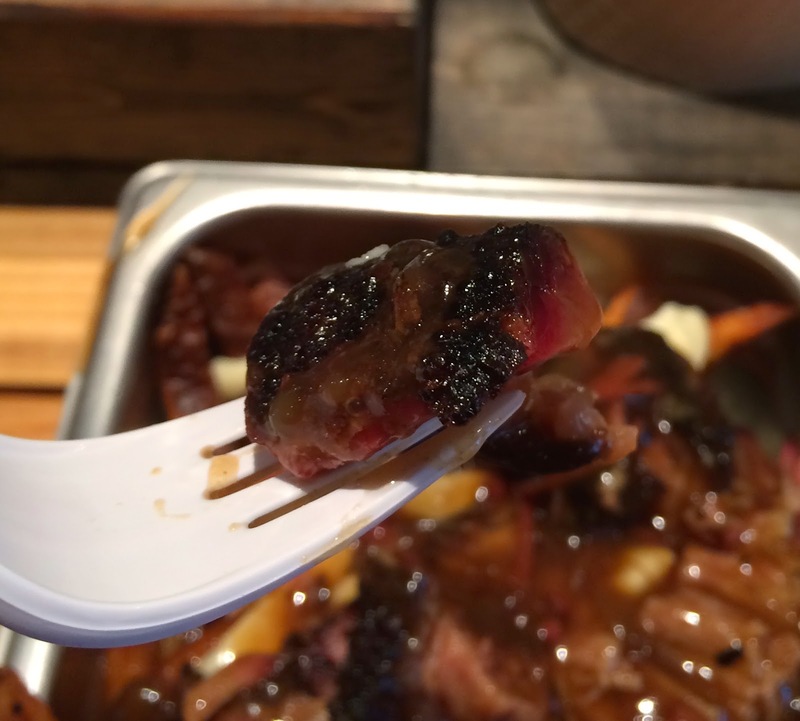 Blackstrap BBQ was one of the Poutine Week 2014 participants, and I decided to try their "Burnt Ends Poutine." 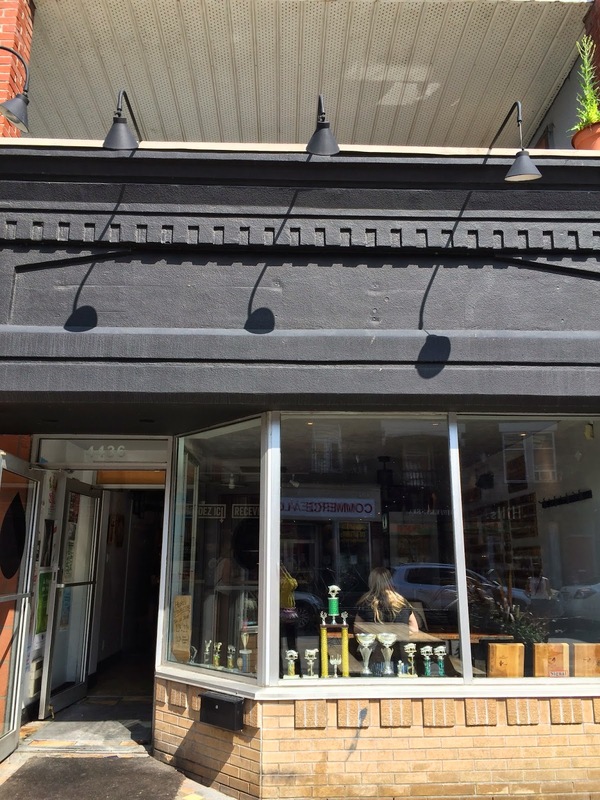 Blackstrap BBQ, according to the webpage, offers an authentic Memphis-style barbecue. The meats are cooked slowly to give a deep and complex smoke flavor daily in the two Old Hickory Pits, imported from Cape Girardeau, Missouri. Their to-go containers are made of bagasse, 100% compostable and biodegradable. And their plastic cups are made from Poly Lactic Acid, a derivative of corn, and their plastic forks and knives are made from Plant Starch Material and they're all compostable. Besides they recycle all their bottles and cans. When I was walking from De l'Eglise station, there's no board or any sign outside so I almost walked pass by. I got there around 3:50 PM and there're about 3 customers. In front of the restaurant, there're 2 large picnic tables which seemed to be able to hold 8 persons each. 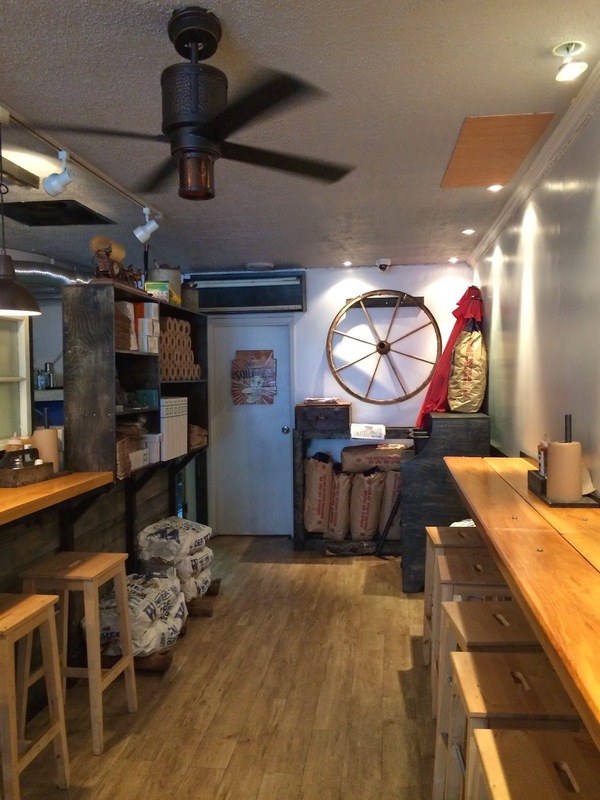 In the restaurant, there're also 2 tables as large as the ones outside, and 2 rows of counter seats; one was facing to the wall and the other was facing to the kitchen. 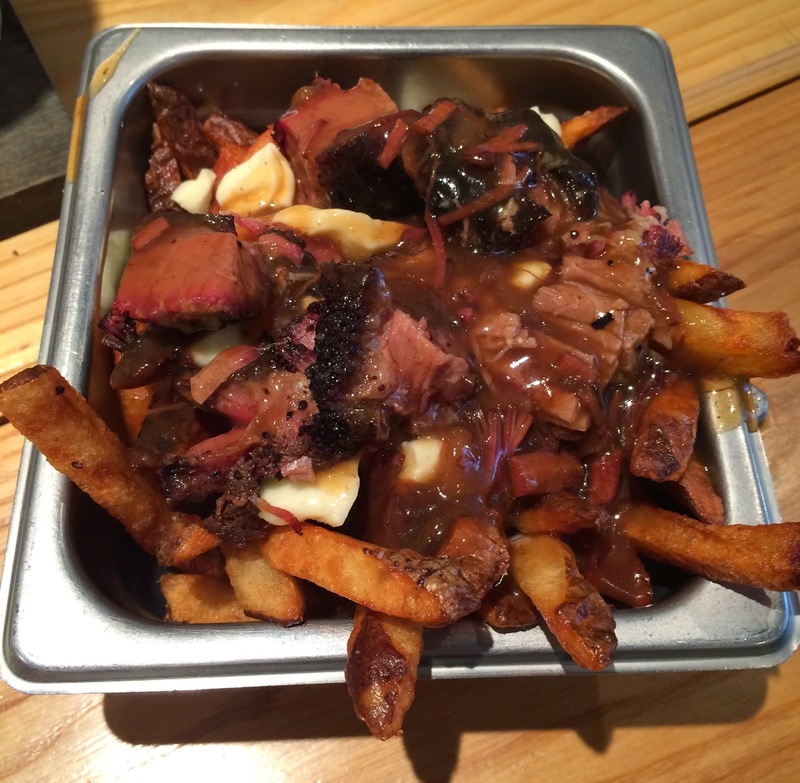 As I knew what I was gonna get, I ordered one "Burnt Ends Poutine" and I said I'd eat inside. I told my name when I placed an order as it's self-service place though the payment procedure (I used a debit card) already had "add tip?" --- and I gave 10% not knowing the level of the service. In about 10 minutes, my poutine was ready and a guy in a kitchen called my name with weird tone and confused face --- they didn't expect to see a Japanese name I guess. I asked for a fork, then he said bluntly it's by the wall (to pick it up on my own) without smile, and I noticed that they take orders decently but never smiled. The silver container was about 20cm x 20cm (7.9 inch. ), and the depth was about 7cm (2.8 inch.). It's much heavier than I thought when I picked it up. 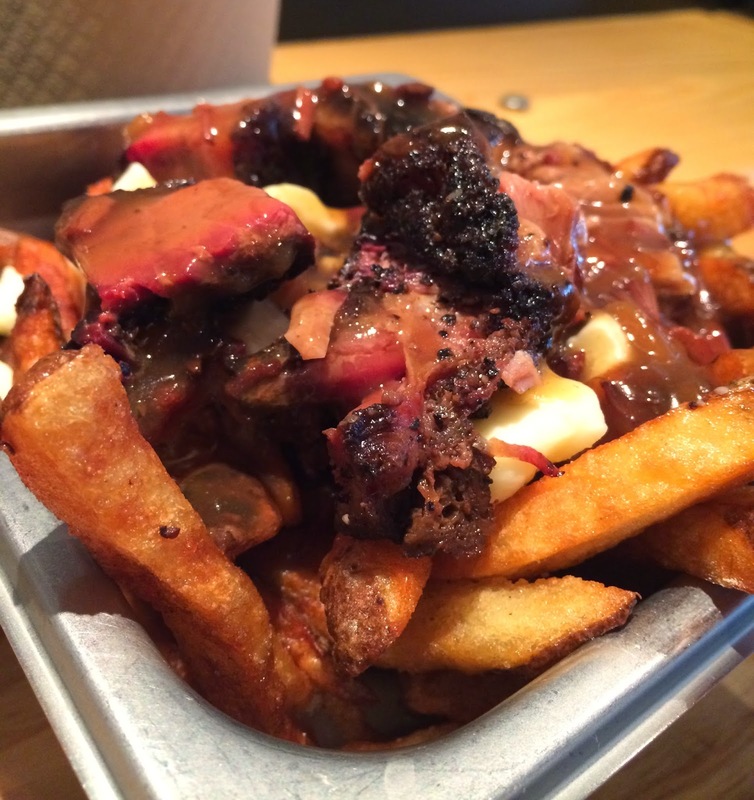 Over thick fries, there're cheese curds, gravy sauce and burnt ends. 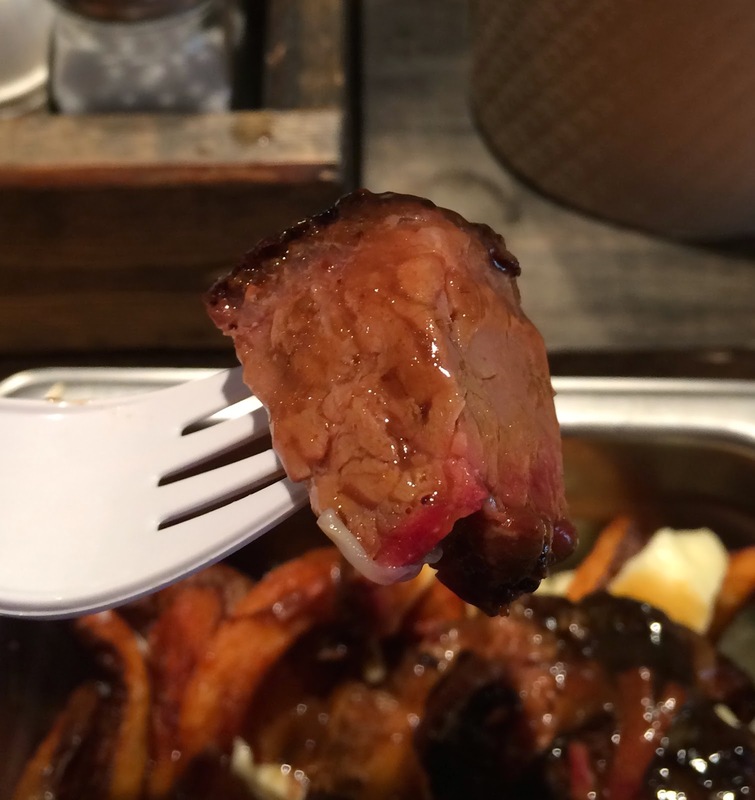 The chunks of burnt ends were covering the surface almost fully. Burnt ends were fragrant, salty, and dried texture outside like beef jerky, but inner part was soft, moist, juicy, and easily fell apart. Burnt ends were seriously tasty. Fries were thick fries and not golden brown but brown. Overall they're crispy, but especially the ends were crunchy. Gravy sauce was sweet but maybe the meat was salty so that it tasted sweet. It's runny but had a bit of thickness that is common in gravy sauce. 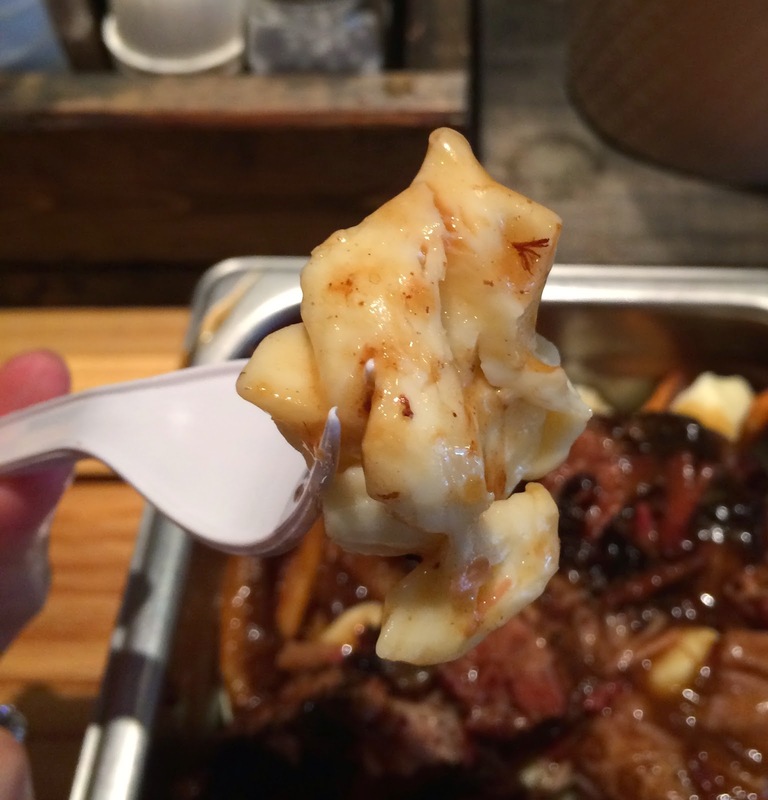 Underneath the burnt ends, there're large pieces of cheese curds and they had some squeakiness. 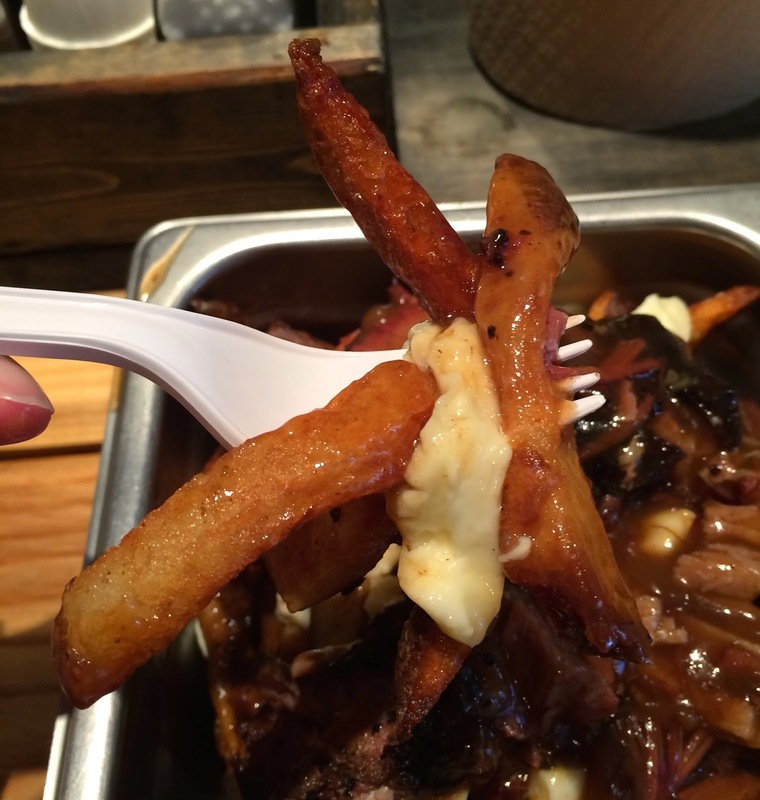 They're soft outside which might be due to the heat of fries, gravy and the smoked meat. 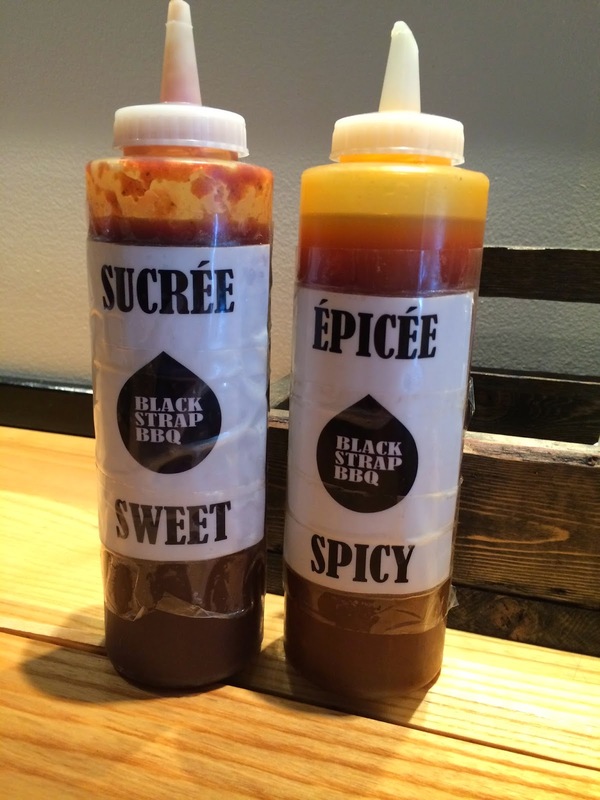 There're 2 kinds of sauce; sweet and spicy. I wasn't sure if I was supposed to use it for poutine, but I tried the sauce anyway. 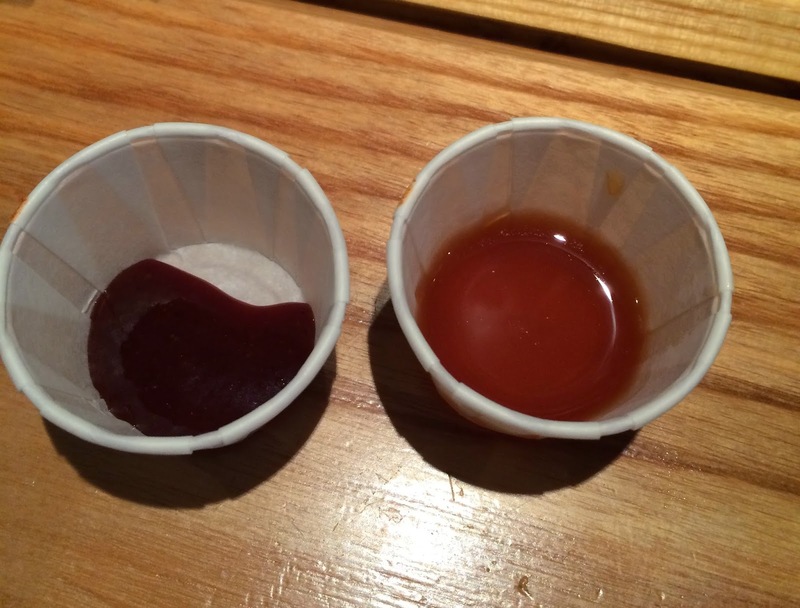 Sweet sauce (on the left below) seems sticky but it was much lighter than it looked. It had black pepper and had sweet flavor like honey. Spicy sauce (on the right above) was like a water. It had very strong vinegar taste and flavor, and aftertaste was tangy and spicy. Personally I didn't like the weirdly acid scented sauce. I tried both on burnt ends, and I figured the best way to enjoy the burnt ends was to eat it as they were. Even though I was really hungry, I couldn't finish the poutine. I left some a couple of fries and cheese curds but ate all the meat. The burnt ends were smoky and providing deep flavor, which made me hungry first then it made me feel full later. All the employees were talking in English, so I'm not sure if they're quebecois.